Posted on November 25, 2010 by Jill B. Once the turkey and mashed potato induced coma subsides from your Thanksgiving meal, it’s time to get cracking on your holiday gift list. Electronic devices and gadgets are always crowd pleasers under the Christmas tree and flash drives are no exception. – Custom USB flash drive personalization: A great holiday gift for clients and employers alike. A promotional USB flash drive is not only useful, but a special-made logo or design on its casing will go a long way in establishing your brand. There are a number of USB flash drive products and services companies that can help you create your drive just in time for holiday gift giving. – Style and storage: The Omnitech Bling flash drive could easily spark interest in technology from the fashionista in your life. If you don’t think her jewelry box will fit its thousandth piece of bling, this gift gives sparkle some substance. Perfect stocking stuffer for a loved one or Secret Santa gift for an office coworker. – When safety and security come first: For your devoted technology geek or for someone looking for the best private yet portable storage, Iron Key USB flash drives are a one-of-a-kind gift. In 1GB to 32GB sizes, this device has it all: password protection, virus protection, 256-bit hardware encryption and even for the most compromising circumstances, a self-destruct mode. – For the most studious of students: Note taking with a twist, your student will have no choice but to take in every detail from class. Livescribe’s Echo Smartpen is almost a flash drive, but not quite. However, it’s so cool; we just have to count it. With the help of a Micro-USB connector, it transcribes your notes and the pen’s recorded audio from the pen to your computer. It has a storage capacity of 4GB to 8GB. The USC cable will also charge the pen for you. – The need for speed: USB 3.0 is still relatively new to the consumer market, but a SuperSpeed flash drive is an ideal gift option for those who want fast, instant data transfers. Keep in mind that for maximum speed, use the drive along with a USB 3.0 expansion card or motherboard. Check out Super Talent’s Express Duo drive for affordability or Kingston Data Traveler for performance. – Go for novelty: When all else fails, a uniquely shaped flash drive is sure to make a few heads turn or create some smiles. They’re the kind of gift you never knew you wanted, but can’t live without once you have it. MIMOBOT is a pro at designer USB flash drives. From Star Wars to Hello Kitty characters, with a bunch of unique, colorful cartoon characters in between, the company is all about making digital storage fun. Keep your eyes peeled for the MIMOBOT’s holiday deals. 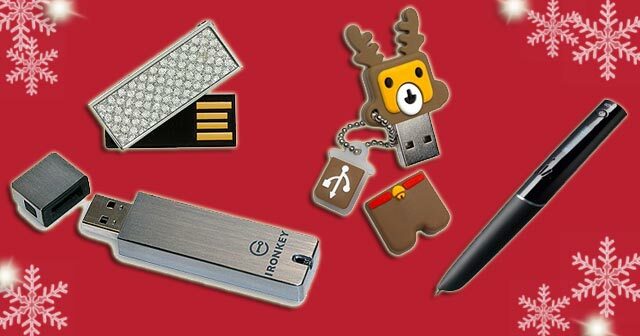 For the flash drive fanatic who has them all, you can check out holiday themed Patriot flash drives to add seasonal cheer to your loved one’s collection. What other USB gifts and gadgets are you thinking of add to your wishlist for the holiday season? This entry was posted in Articles, Flash Drive, Kingston DataTraveler, Kingston Technology, Promotional USB Flash Drives, USB Flash Drives, USB Technology and tagged Custom USB flash drive, holiday themed Patriot flash drives, Iron Key USB flash drives, Kingston Data Traveler, Livescribe Echo Smartpen, MIMOBOT designer USB flash drives, Omnitech Bling flash drive, promotional flash drive, Super Talent Express Duo drive. Bookmark the permalink.